(Almost) Wordless Wednesday: Where's the Windex? Thimble is here today instead of tomorrow for her usual Thimble Thursday post. Why? Well, you'll see tomorrow! Always remember to be cautious when using any sort of chemical or cleaner around your furbabies. This is not only with regard to the risk of your furbaby ingesting it, though. Keep in mind that many cleaners can also be painful and potentially caustic to your cat or dog's eyes, and potentially even to their skin and paw pads. To be on the safe side, it is always wise to do any sort of cleaning and scrubbing without the assistance of your cat or dog. If need be, especially if you have an especially helpful furbaby, it might be best to block them from any room in which you are using chemicals or cleaning agents. As always, better safe than sorry! A certain pup around these parts loves to go on walks. What's more, one of Astrid's favorite things to do on walks is, well, evacuate her system. It's gotta be done, as they say. What's more, since it's not polite to leave such presents just lying around in neighbors' yards, and since Astrid lacks opposable thumbs, this human serves as the cleanup crew. We try to be as green as we can here at our home. In trying to maintain this way of life, we attempted to reuse plastic grocery bags to transport Astrid's intestinal gifts back to our trashcan. Let's be honest, though. It would seem that our local stores prefer to test out the strength of their plastic bags using something along the lines of a katana. And let's just say that the bags always fail this test, and therefore also fail to hold up to Astrid's recycled food. So, we resorted to bags specifically designed for picking up pup poo. We've tried multiple different kinds, some we've liked, and some not so much. Given that we were running low on our most recent stash of bags, ones which were sometimes just a tad too small and thin to fit the intestinal contents of a 65-lb dog, it was decided that Astrid's review for this month's Chewy.com Blogger Outreach Program would be of Frisco™ Dog Waste Bags. This product looked promising from the get-go. As the box says, this particular selection comes with a whopping 900 bags! There are 15 bags per roll, which means this box is stuffed with 60 rolls of bags. What's more, this particular deal also comes with 2 bag dispensers. I used to stuff my pockets with bags. I am ashamed to say, though, that I have left the ecosystem less than pure after some of those bags managed to escape my pockets somewhere in our neighborhood. To avoid further incidents such as this, I was planning on getting a bag dispenser, and so was very happy to see that this Frisco™ deal came with not only 1, but 2 of them. Although I at first found the dispenser's uber secure clip difficult to open, it was finally managed and attached to Astrid's leash. I don't see it going anywhere anytime soon. Again, Astrid is a 65-lb dog, and her deposits show it. So, the size of the bag is very important. The product description says these bags are 13" tall x 9" wide, which sounded pretty decent. Still, though, I had to pull one out as soon as the box arrived to see for myself. Did it pass the size test? It sure did! And after a few field tests, it was determined that these bags are indeed just the right size for grabbing up poo and tying it up afterwards. What's more, the plastic of the Frisco bags are on the thick side, especially when compared to some of the bags I've previously used. And trust me, this is a good thing! You can even choose between scented or unscented bags from Frisco™. I chose the unscented, only because, personally, my nose has always been a bit put off by the warped scent of any fragrance trying to mask puppy sewage. I'm probably just weird like that, though, so the scented version of these may very well be great at their job! What it comes down to is that the Frisco™ Dog Waste Bags seem just right for, well, the job at hand. And this particular pack seems like quite a deal, if you ask us. On Chewy.com, it's currently a mere $14.97 for these 900 bags and 2 dispensers. Although I won't name any names, I've spent at least that much on a small fraction of 900 bags at other locales. So, be sure to check out this deal if you're in need of a hand at picking up some puppy poo. Now, on with the walk! Wishing all of our furiends a very happy Tuesday! Disclaimer: As members of the Chewy.com Blogger Outreach Program, we received Frisco™ Dog Waste Bags, and dispensers, in exchange for an honest review. All opinions are our own. We only review products that we believe will be of interest to our readers, and we never recommend a product that we do not believe in. Although there has for quite some time been debates regarding the use of dog or even cat feces as fertilizer, the truth of the matter is that there are a number of potential diseases and other health concerns related to this practice. Retinal disease in children, for example, was found to be a result of the use of dog feces as fertilizer in one particular study. For this reason, among many others (including good manners! ), please always be sure to pick up after your pup, and even after your outdoor kitty, if possible. It's Evan's favorite day of the week, Mancat Monday. On this particular Mancat Monday, though, Evan has a bit of a problem. You see, his silly human of a mother is refusing him an open door. See that door behind him, all shut up and closed? How can a boy chillax in the sun if his beloved door is closed? Evan says his mom's reason for the current closed door policy is just silly. You see, it's almost September, with autumn just around the corner, and that obviously means it's the perfect time for 95 degree Fahrenheit weather. And when that giant ball of light in the sky shines in through Evan's beloved door, it more or less turns the entire front of the house into an oven. Believe it or not, that prompts this human to shut the door before all those inside melt. Evan, to put it simply, finds this thoroughly unacceptable. We hope all of you have a wonderful Monday! And Evan hopes all of his furiends out there get to enjoy lots of sun puddles today, without the interference of silly humans like his mom! Have you ever wondered why your kitty tends to seek out warm places, such as sun puddles, a fireplace, or perhaps even near the oven or stove? Well, there are a number of potential reasons for this. It can stem from the fact that as kittens they need their mother's body heat to maintain their own, or it can result from instinct telling them to find a warm place to sleep so that their body will not have to waste energy maintaining its own heat during a nap, or it can simply be a remnant of the fact that most domesticated kitties stem from a desert cat ancestry. So, there are a number of potential reasons why our kitties seek out warmth. All of that being said, it is always important to be observant of how well your kitty seems able to keep warm. Kittens and older cats may have an especially hard time maintaining their body warmth, and so access to sun puddles, warm blankets, and other warm yet safe places to sleep are important. At the same time, though, always be aware and cautious of your kitty's tendency to gravitate towards heat. Overall, cats' sensory receptors are not as sensitive to heat as our own, which is why they can be more susceptible to overheating or attaining injuries from fireplaces or other open flames, ovens, and stoves. So, do be sure that your kitty has access to warm sleeping spots, but at the same time please make sure that all dangerous sources of heat are off limits to kitty. As I mentioned yesterday, the special meaning of this day was initiated by Deb Barnes of Zee and Zoey's Cat Chronicles, after she lost her kitty Jazz on August 28, 2013. To learn more about this day, please click here. There are multiple angels of mine over at the Rainbow Bridge, all of whom will always be remembered. 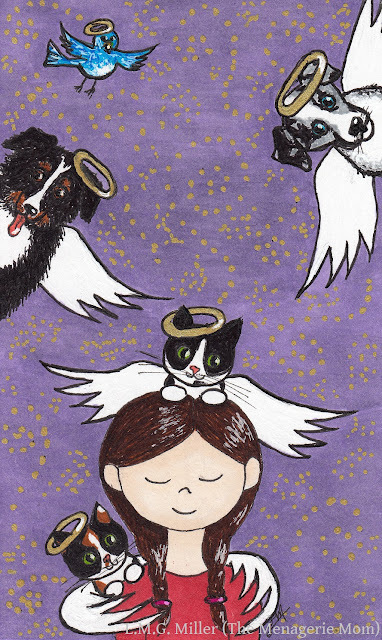 In honor of all of them, for yesterday's Caturday Art blog hop I created a drawing more or less illustrating myself with the furry angels from my childhood. One of those angels was my dear Rosie, who just passed away in May of last year. As many of you may know, I was blessed enough to share over 21 years with my sweet girl Rosie. My parents adopted her when I was 4 years old, and she was my best friend and confidant until we had to say goodbye when she was 21 and myself 26. As I'm sure you can all guess, that one hit me hard. But, as I know Rosie would prefer, I try not to have sadness in my heart when I think of her. Instead, I always do my best to remember all of the good times. And there were lots and lots of those. How could there not be? 21 years is a blessedly long time to make memories. One of my favorite memories with Rosie occurred just three years before she passed away. I know I've shared this memory at least once before on this blog, so I apologize if this is not a new story for some of you. But, I'll be retelling it now for those who don't know the story or who might not remember it. Back in May of 2013, when Rosie was 19, already diagnosed with renal disease and on quite the daily regimen of treatments, my parents, sister, and I all decided to take a family trip to Michigan to visit my uncle. That was a 9 hour drive, and we would be gone for a couple of days. The problem was that Rosie was honestly doing great, kicking renal disease in the rear end, her appetite great, and her renal values staying stunningly stable on her daily regimen of treatments. Add to that the fact that she would not eat, drink, or take meds for anyone but us, we didn't know what to with her during the duration of our trip. If we left her in someone else's care, she would more than likely go off food and water and refuse to take all of the medications that were keeping her renal disease at bay. After going back and forth, deliberating, weighing our options, we finally made the decision to, well, take Rosie with us! Sounds like quite the plan, huh? Long story short, though, Rosie did wonderfully on the trip. She didn't seem to mind being in the car one bit, she owned that hotel room of hers, and she ate and drank, took her meds, used her litter box (yes, we brought it with us), and did all of her normal daily activities even while away from home. The only kink was that she was only happy (albeit very happy!) in the car if she was riding on a lap. She didn't want to be in the safety of her carrier, no siree. So, of course, we let her have her way. Although admittedly not the safest method of traveling with a kitty, Rosie got to sleep on a lap for all 18 hours of the drive. This is, therefore, our entry for today's always anticipated Sunday Selfies blog hop, hosted by our good buddies over at The Cat on My Head. Our wonderful host is also partaking in Rainbow Bridge Remembrance Day, so be sure to head that way to meet their furry angels, and to see the selfies of all of the other lovely participants. We are wishing all of our furiends a beautiful Rainbow Bridge Remembrance Day! We hope all of you can enjoy a day full of happy memories of your furry angels. Everyone copes differently with the death of a furbaby, and there is absolutely nothing wrong with that. We are all unique, and for that reason we may wish to remember or angel furbabies in our own unique ways. There are a number of things you can do to help you remember a lost furbaby. For example, you can have your furry angel cremated, and you can select an urn that might have special meaning. You can choose to create even just a small shrine for your furry angel, in your home or in your garden. You can hang photographs of them, create photo albums or scrapbooks, or have artwork of them created and displayed. There are also headstones or memorial stones, which can be customized, that you can display either in your home or in your garden in honor of your angel furbaby. Some people like to carry their furry angels with them in the form of lockets or other jewelry, or even tattoos. These and many other options are just some of the ways to remember a lost furbaby, and none of them are wrong. As I mentioned yesterday, though, please always remember your furbaby fondly, as they would want you to always remember the good times! 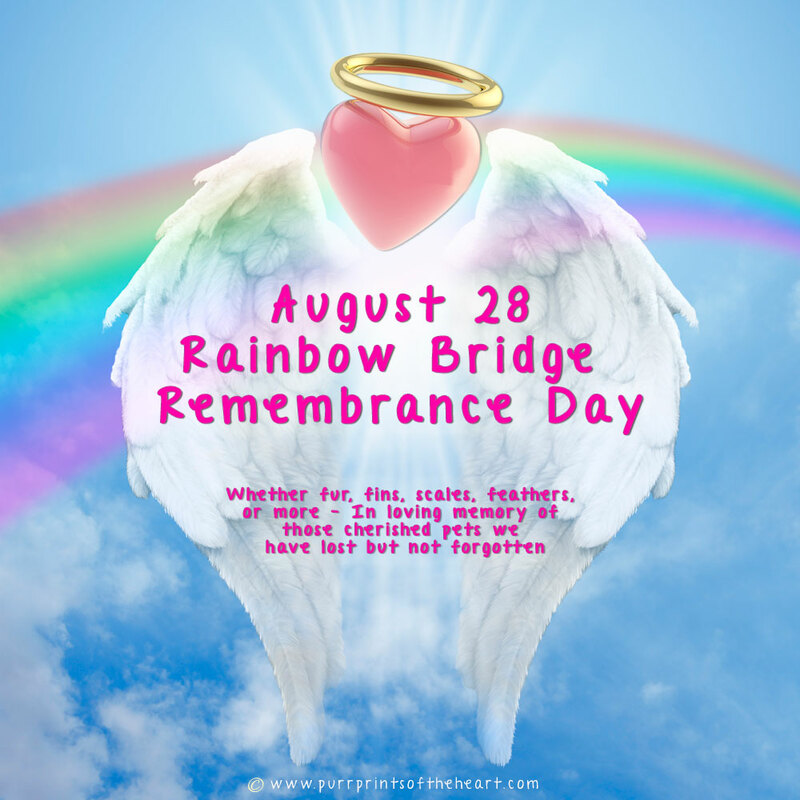 Tomorrow, August 28th, is Rainbow Bridge Remembrance Day. This is a day to honor and remember our furry angels, and it was initiated by Deb Barnes of Zee and Zoey's Cat Chronicles, after she had to say goodbye to her beloved cat Jazz on August 28, 2013. To learn more about Rainbow Bridge Remembrance Day, just click here. This drawing illustrates my furry (and even feathered!) angels, all of them being childhood comrades of mine, and some of which also grew with me into my adulthood. Of course, my beloved calico angel Rosie is in this drawing, as well as her loving brother Sammy. The other three angels you see here are Shellie the sweet Shetland Sheepdog mix, Banjo the loyal Australian Shepherd, and even my fun feathered friend Pippin the budgie . Since tomorrow is Rainbow Bridge Remembrance Day as well as the fun Sunday Selfies blog hop, we will be posting a special picture that fits both categories. It's one of this human's favorite pictures she has with sweet angel Rosie, taken during one of our adventures together. We want to make tomorrow a day of happy memories, so we can't wait to share ours as well as see those of others. Have a beautiful Caturday, furiends! Today's tip is plain and simple, and it is to please do your best to always remember your Rainbow Bridge angels fondly. Although losing them can and does indeed fill us with grief, always remember the good times. After all, that is surely what your furbabies would want. We give our little furry babies the best lives we can in the time that we have with them, and although they may not be able to verbally express it, please know that our furbabies are grateful for and filled with love over this. That is why, to honor them, we should always focus on the happy, fun, beautiful memories we created with them. What's more, to further honor them, please feel free to share such memories tomorrow, on Rainbow Bridge Remembrance Day. We've made it to another Friday! Whew. 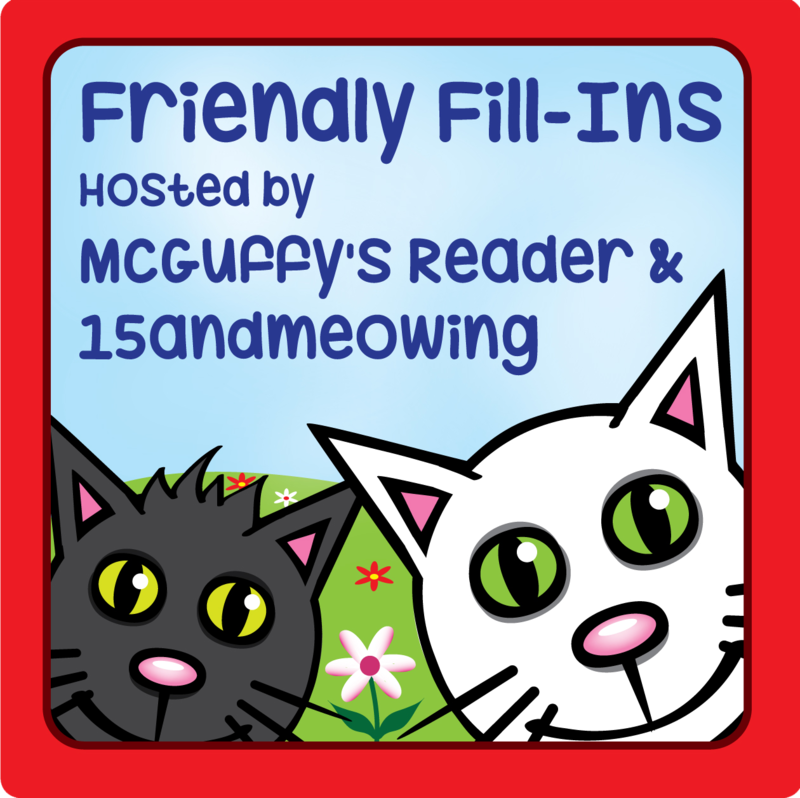 As always, we've been looking forward to the weekly Friday Friendly Fill-Ins challenge, hosted by the ingenious 15andmeowing and McGuffy's Reader. I really liked this week's fill-ins from the second I saw them. 1. I wish _________ would bring back _________. 2. An act of kindness that I do often is _________. 3. I still have _________ from my childhood. 4. If I didn't have _________, I'd be completely lost. 1. I wish Mars would bring back PB Max candy bars. 2. An act of kindness that I do often is bake treats for family and friends. 3. I still have a Barney the Dinosaur sleeping bag from my childhood. 4. If I didn't have pen and paper, I'd be completely lost. Thanks, Eddy! If blurry and off-center was your goal, you scored! We want to wish everybuddy a wonderful Friday! We hope you have lots of fun planned for the weekend! A cat or dog stretching is usually very good sign. It means they are comfy, happy, content. But, in some instances, it can actually mean the opposite. If you cat or dog is stretching repeatedly or at an abnormal frequency, such as perhaps after eating, you may want to take note of this. Sometimes, if an animal has abdominal comfort, constipation, or something along these lines going on internally, they will stretch in attempts to feel relief. That's not to say that you should worry if you see your cat or dog stretching, because more often than not a stretch is a very good thing! But, you know your furbaby best, so do be aware that even normal activities like stretching could potentially be a cause for concern. Thimble knows that summer is nearing its end. She also knows how to make the most of this situation, though. Thimble knows where to find the brightest puddle of sun. And how to pose in it! She makes sure to give her mom lots of time to snap some shots. After all, she is a highly skilled model. While summer is certainly a lovely time of year (when you're not too busy melting, that is), this human will openly admit that her favorite season is autumn. I think my furbabies like it quite a bit, too, because around these parts lovely autumn weather mean lots of open window time. Needless to say, we're all pretty excited about the next season just around the corner. What about all of our furiends out there? Are you excited for autumn? What's your favorite season? We've previously touched on the topic of spring and summer allergies, such as those to pollen and grass, which can affect not only us but our furbabies as well. But, with autumn just around the corner, perhaps it's a good time to note on the allergens that this impending season is more likely to offer. Along with lingering ragweed, one primary allergen that is especially prevalent in the autumn is mold. This is because all of those beautiful autumn leaves will unfortunately fall, and when they lie on the ground and get rained on, that can produce the perfect environment for mold growth. To help minimize your furbaby's direct exposure to this and other allergens, aside from keeping leaves raked up as best as possible, be sure to wipe off yours shoes or remove them upon entering your home. It might also be wise to keep windows closed if the weather is more on the wet and rainy and therefore especially moldy side, or if it is windy and therefore more likely to blow allergens into your home. Of course, the fault doesn't always lie with the great outdoors. Towards the end of autumn you may start to use your furnace, and that could lead to built up dust causing flareups of allergies. Try to dust off the furnace and registers and vents, and perhaps consider using an air purifier. As beautiful as autumn is, nothing can be perfect, so be sure to keep an eye on your furbaby for signs of autumn allergies, such as discharge from the eyes or nose, sneezing, coughing, and itching and scratching. In a past tip, I mentioned that, while cats can indeed see far better than humans as well as dogs in the dark, research has indicated that they do not have night vision in the sense that they can see in complete darkness. This is why, for your cat's safety and comfort, I noted that it can never hurt to leave a light on for your kitty after darkness falls. Now, what about dogs? Well, research shows that dogs can indeed see better than humans in a dim room. And their eyes allow them to see in even darker dimness than we can. But, it would seem that dogs lie somewhere in between cats and humans when it comes to seeing in the dark. Like us, though, to a pup a pitch black room is a pitch black room. Imagine how you feel when standing in a room with absolutely no light, and then imagine how your pup must feel in that same circumstance. For this reason, please do consider leaving a night light or a lamp or two on for your pup (and kitty) at night. Especially as they and their eyes start to age, having even a dim light source can help them be and feel safer while navigating even their own familiar home in darkness. That being said, as part of this month's Chewy.com Blogger Outreach Program, I chose for my kitties a moist food that I really hoped they would like. That food is the I and Love and You® wet cat food variety pack. As is typical, this food made the cut for me in large part because the first and primary ingredient is a real protein source. For this variety pack, that is either poultry in the form of chicken (aka, Chicken Me Out™, but which is listed as Chicken Lickin' Good™ on the box) or turkey (aka, Purrky Turkey™), or fish (aka, Oh My Cod!™). I and Love and You® food also contains real fruits and vegetables, with natural vitamins and minerals and taurine. There are no fillers or by-products meals, no corn, wheat, soy, or rice. There are also no artificial preservatives, flavors, or colors. It is grain free, gluten free, and made in our very own USA. All of that being the case, I really wanted my kitties to like this food. So far, there are exactly two kinds of moist food that my kitties are willing to eat religiously. I would love to add more variety to this, so that they don't get bored of the same old thing. So, how did my kitties rate this I and Love and You® food? Let's get to that now. Given that my kitties tend to lean toward a chicken preference, out of the three flavor choices, I selected the Chicken Me Out ™ recipe to break the ice. The food is a nice pate, soft and smooth, which is always my kitties' preference. It also smelled like, well, like something that a kitty would really enjoy. So I divvied some out. Thimble came to the kitchen right away. I'll be honest, I've learned that the girl doesn't always have the best nose, so the fact that she came in with her sniffer up in the air seemed like a great sign. And how did she like it? Well, she gave it a quick sniff, and then walked away. As I've noted in previous reviews, this is not atypical of Thimble. She loves to beg for food, and then not eat it. It's sort of her thing. What can I say? She's a tease. Next up was Evan, who immediately followed Thimble into the kitchen. He is not much of a food beggar, so I again thought I had a good sign in his apparent interest. And what did he do? He sniffed the goods. But then he also walked away. My third kitty, as you might know, is Eddy. But, who remembers what I've said about Eddy in the past? Well, she simply doesn't eat moist food. She ate it as a kitten, and then one day, she simply ate it no more. She absolutely, tremendously, and endlessly adores dry food. And that's it. So, I guess she doesn't get a vote here. But, fear not! All hope was not lost. Housemate Toby (you know him, the fuzzy black fellow whose human mom is my sister) meandered over. And you know what? He took one whiff of the I and Love and You® chicken recipe and started scarfing it down like there was no tomorrow. So, the I and Love and You® chicken recipe was certainly a hit with Toby. With my kitties, not so much, but so it goes with food snobs. I have also since tried the turkey recipe (Purrky Turkey™), with very similar results. The long and short of this review is that, after being offered the chicken and turkey recipes, my little food snobs are, it would seem, not fans of the I and Love and You® wet cat food variety pack. Our housemate Toby, on the other hand, is quite taken with it. This natural, protein-rich food could be a great addition to your own kitty's diet, so if it sounds like something your kitty might enjoy, head on over to Chewy.com and give it a try! Disclaimer: As members of the Chewy.com Blogger Outreach Program, we received the I and Love and You® wet cat food variety pack in exchange for an honest review. All opinions are our own. We only review products that we believe will be of interest to our readers, and we never recommend a product that we do not believe in. Salt intake can affect our cats and dogs just like it can affect us. Salt in the diet is necessary for our furbabies, as it affects the electrolyte balance and the overall health of the cells in the body. But, too much salt can be very dangerous. Salt toxicity can occur in the event of excessive intake of salt, in which case you might see vomiting, diarrhea, stumbling, excessive thirst, and even seizures. Therefore, if your furbaby has a tendency to eat or steal scraps of your food, always keep in mind the salt content. Also keep in mind that salt is not only present in food, but can also be consumed by your furbaby from sources such as salt water aquariums and rock salt used to melt ice. If you have any concern that your furbaby might have consumed too much salt, consult a veterinarian immediately. Over the past couple of weeks, Evan has shown off a number of his skills. Snoozing, bathing in the sun, posing pretty, overall front door exhibitionism. Evan is a Jack of all trades. Now, today, he has a new skill to show off. The art of ambush. Start by lurking in the shadows. But be sure to stay alert. A kitty must always be ready to pounce. Hmm, maybe a crouch to prepare for pouncing? Don't forget to look scary! We're wishing all of our furiends a wonderful Monday! Today's simple tip is to always be aware of your furbaby's location when shutting doors. Kitties especially are very fast and like to dart, so never slam doors, so that you never risk serious injury with the momentum of a hastily shutting door. Cat and dog legs, paws, and tails can easily be injured in a closing door, so always make sure that these furry little appendages are clear of a door before closing it. Should your kitty or pup have a run-in with a door, assess the situation, and get them to a veterinarian in the case of potential sprains, breaks, or any serious injury. Evan hasn't gotten to star in his very own Sunday Selfie post in quite some time. I told him this week we'd remedy that. 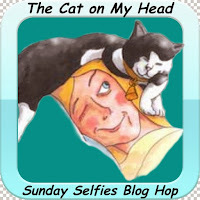 So, without further ado, I'll now give Evan the floor (by the front door, of course) for today's fun Sunday Selfie blog hop, hosted by the pawesome kitties over The Cat on My Head. "But wait, let me bathe first. I'm filthy." We hope everybuddy is having a wonderful weekend! As I'm sure most of you know, cats are fast, flexible, and amazingly proficient contortionists. Much of this comes down to the cat's spine, with its vertebrae and disks engineered for flexibility and elasticity. Of course, it also helps that their shoulder blades are attached by muscle alone, with no bones to hinder them. Because the cat's spine and shoulder blades are so flexible, they can jump many times their own height, twist while in midair, squeeze into impossibly small places, and stretch and roll into incredibly contorted positions. That all being said, just as with humans, when a kitty ages, their flexibility may very well start to lessen. They may not be able to jump, run, stretch, and contort themselves as well as they used to. Arthritis can affect kitties just as it can humans, which can make their range of motion far less than it once was. So, especially since you know your kitty best, remember to watch for signs of slowing down, stiffness, discomfort, or pain. Although aging and some of the ailments that come with it are inevitable, that does not mean their are not ways to keep your kitty comfortable. If you see your kitty missing landings or refusing to jump altogether, stretching less, or running or moving about less or with difficulty, please consult your veterinarian regarding methods and perhaps even medications to help your kitty stay comfortable and pain-free. It's probably pretty obvious that I love to draw my furbabies. They do make for some pretty cute muses, if I do say so myself. 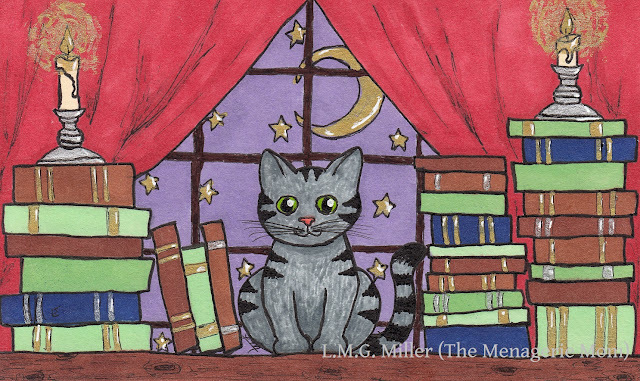 That being said, this week's drawing for Athena's Caturday Art blog hop, which we look forward to each and every week, was inspired by just this past Thursday's post starring Thimble. 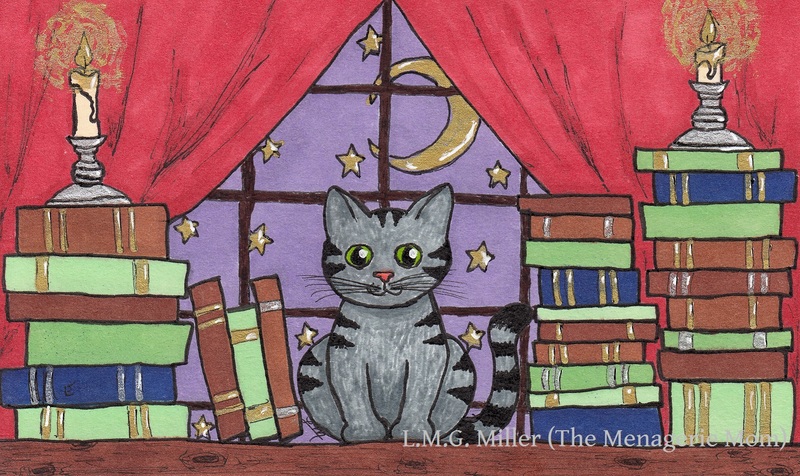 Remember that post, when Thimble the Librarian invited you to check out some books? Nothing's as good as the adorable real deal, but this sure was fun to draw! Be sure to visit Arty today for the last Pawlympics event - Smileys! Astrid and many other pro athletes are competing in this happy event! Despite what the above drawing might indicate, please remember to never leave candles or other open flames unattended around your furbabies. Such flames are, of course, dangerous and an overall fire hazard. Candles, fireplaces, stovetops, and even outdoor firepits or grills should always be carefully monitored with furbabies around, or completely blocked off from their reach. If you are concerned that your furbaby might have come in contact with and been injured by such a fire hazard, check their fur, skin, mouth, paw pads, and any points of potential contact for burns or other signs of injury. And, of course, get your furbaby to a veterinarian if any burns occur. We love Fridays around these parts. Who doesn't? 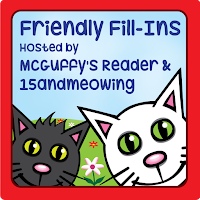 And, who doesn't love the Friendly Fill-Ins challenge that Friday brings? 1. When I run out of _________, I use _________ instead. 2. My guru is _________. 3. I am afraid of _________. 4. I feel empowered _________. I always try to live up the to fill-ins' potentials. But, I'll let you all be the judge of my success, or lack thereof. 1. When I run out of tissues, I use toilet paper. 2. My guru is my angel Rosie. 3. I am afraid of mankind's potential. 4. I feel empowered when I do a good deed. Now, are you ready for a little Eddy fix? Can you believe how she's mostly sitting still here?!? What prompted this moment of calm, you ask? The answer would be the promise of sitting on the seat of her mommy's exercise bike. Want to know something else? Eddy's especially fond of sitting on it after her mommy has just finished using it. And want to know what's even better? When her mommy puts down her nasty sweat towel for Eddy to lie on! Eddy thinks that makes the most perfect bed. Yep. Nothing like the aroma of the mom's sweat to lull a girl to sleep. Happy Friday, everybuddy! We hope you're ready for the weekend! Be sure to visit Hailey today, as she is hosting the Pawlympics Freestyle Napping event. Astrid and many other talented pro athletes are competing for those precious gold medals! Also be sure to visit Jakey for the Stuffy Deading event! Although above I may have cited a fear of some of the world's advances, such as tracking devices, there is one such advancement that it is truly beneficial, and that would be microchips for our furbabies. That's why today's tip is to please have your furbaby microchipped. What's more, please remember to register that microchip with all of your current information, and all of your furbaby's current information. If the microchip company allows for pictures to be uploaded to their site, please do consider putting an up-to-date picture of your furbaby, so that he or she can be more easily identified in the case that they become lost. And please make sure that you stay on top of renewing your furbaby's microchip as needed. Some company's require yearly renewal, sometimes with a fee, so be sure that you are familiar with this setup for your furbaby's microchip in particular. Microchips can be a godsend if your furbaby goes missing. Many veterinary offices, shelters, and animal control facilities will scan for a microchip when a lost animal is brought in. So, be sure your furbaby has one, and that it is kept up-to-date. Better safe than sorry! If you need anything, just head on over to the help desk. The librarian is quite friendly, not to mention ridiculously adorable. Have you heard the stories about shelters where school kids practice their reading skills by reading to the adoptable animals? And did you know that there are reported cases of abused or otherwise traumatized dogs gaining trust in a human by being read to? Reading to an animal can be very beneficial, both to the animal and to the human. It can indeed be considered a form of interaction, communication, and socialization, not to mention that reading is great for the human mind. This exercise can be especially beneficial to those animals that are more timid or not yet certain of the trustworthiness of humans. It is, of course, important to use a calm and quiet voice in such cases. That being said, your calm voice reading aloud can be soothing to an animal, like a sound machine, and can give the furbaby the chance to observe you and get to know you without feeling threatened. So, if you have or know of a furbaby that is on the timid side when it comes to humans, consider reading to them. What's more, perhaps consider looking into reading programs at your local shelters or rescue groups, or inquire as to how one could be started. Reading really does matter! Be sure to visit our good friend Marg and her kitties and donkeys today (and every day, because they're great! ), because they are hosting the Pawlympics Snuggling event! Evan and Thimble are competing as a duo with one of their closeup snuggles, so be sure to head over and see the warm and fuzzy competition. For some furbabies, being confined in a more or less swaddling manner can have a relaxing or soothing effect, just as it can in human babies. For dogs, there is the ThunderShirt available on the market (you can see Astrid modeling her ThunderShirt in the above picture), which offers a snug sense of protection and comfort during times that a dog is feeling stressed or anxious. This can work for dogs that display a fear of thunder (it was, after all, named ThunderShirt for a reason! ), as well as for dogs who tend to pull on walks (the reason why Astrid was put in a ThunderShirt), or for any other situation in which a dog is feeling anxious. You can also fashion your own makeshift pseudo-swaddle, though, such as by using a snug T-shirt or blanket or towel. For example, if your kitty gets anxious when being given oral medications or when having his or her nails trimmed, securely wrapping the kitty up in a towel (in something along the lines of a "kitty burrito") can make getting the job done easier and, in some cases, far less stressful for the kitty. Of course, as with many things, it always depends on the individual animal, so be sure to take cues from your pup or cat when deciding whether swaddling is for them. Even Eddy was tired enough to take a break from parkouring off the walls to recline in bed (while refusing to the look at the camera, of course). 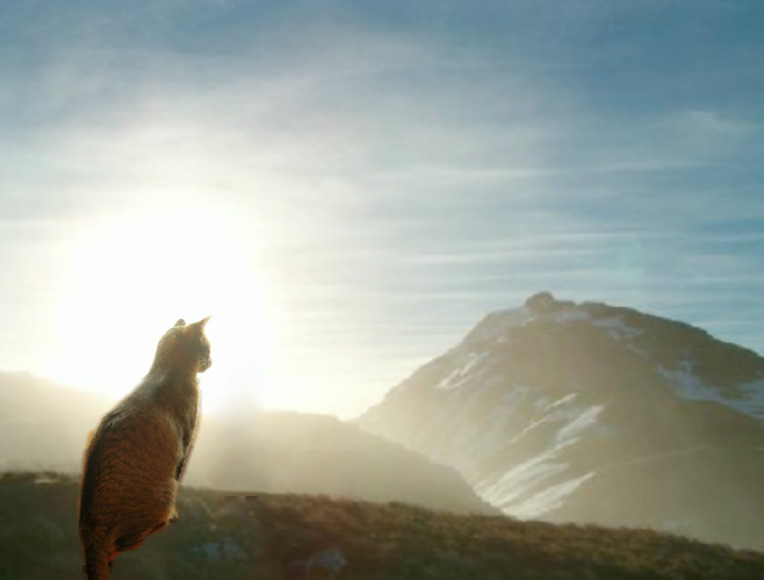 This dazzling image was crafted by Gail, the human behind Bouncing Bertie's Blog. What is this, you ask? Well, this is Eddy's victory shot from today's Pawlympics Munro Bagging event! This event is hosted by Bertie over at Bouncing Bertie's Blog, and it taught us something new. I, for one, had no idea what Munro Bagging was until this event. As you can read on Bertie's blog, Munro Bagging is also known as Scottish Mountain Climbing. What's more, in Scotland, a hill exceeding 3000 ft is called a Munro, and if you climb one of those it's said that you've, of course, bagged a Munro. And so there you have it. Munro Bagging. This event seemed like it was made just for Eddy. Honestly, the girl will climb anything. Eddy and I figured, why not turn that bed post into a mountain? And so, bag a Munro she did. Be sure to visit Bertie today, to see all of the other amazing competitors in this fun event! And don't miss the Bubble Jumping event, hosted by Oreo. And, of course, have a wonderful day, everybuddy! Remember that cats are vertical creatures. What I mean by that is, they like to climb and jump. In the wild they climb trees and watch prey from perches high off the ground. That being said, assuming your kitty is like most kitties, be sure that he or she has some areas in the house to climb and jump. Cat trees are great, but you can also get innovative and stagger sturdy shelves on the walls for your kitty to climb and recline on, or even simply reserve certain sturdy pieces of furniture or boxes specifically for their climbing pleasure. What's more, if possible, try to make sure that at least one or two of your kitty's perches are by a window. This allows them to not only climb up high, but to also use those squirrels and rabbits and birds outside to spark their natural predatory instinct. They'll thank you for the National Geographic channel set up right in their own back yard! Last week, Evan showed all of you furiends of ours his skills at bathing in the sun. At the front door, of course, for the whole world to see. Cleansing of the forearm was focused on last week. So, today, Evan would like to give you all a demonstration on how to do a proper ear cleaning. First you have to get the washcloth paw nice and moist. Slobber up that tongue, guys, because this is going to get messy. Apply slobber to ear. Scrub-a-dub-dub. And you know what your mama always taught you - don't forget to scrub behind that ear! Up and over. Way over. Don't worry, if you're a cat, your head will not pop off. We hope everybuddy has some sun to bathe in today! Just don't forget to wash behind those ears. Evan's little sister Thimble is competing in the Sitting Pretty event of the Pawlympics today, so be sure to visit Dory's Backyard to see her and all of the pretty competitors! And don't forget to also visit Emma and Bailie for the Wabbit Tracking event! Cats are fastidious groomers, as I'm sure you all know. Keep in mind, though, that some kitties have conditions or other circumstances that make grooming difficult. Overweight or obese kitties, for example, often cannot reach to groom their hindquarters. This can lead to matting in that area, as well as an overall dirty condition of the bum. Another example is older and arthritic kitties, who also often have trouble reaching such areas due to pain or discomfort. If your kitty cannot reach to groom certain areas of their body for any reason, they may require some assistance from their humans. For such kitties, you may need to comb them more frequently, or use fragrance-free pet or baby wipes, or even shampoo. There are dry shampoos on the market, as well as sanitizing and deodorizing shampoo sprays. Although dogs are not fastidious at grooming as their feline counterparts, it is still important to keep in mind that, if your pup can't reach their hindquarters or other regions of their body due to obesity, old age, arthritis, or another reason, they also may require your cleaning assistance.